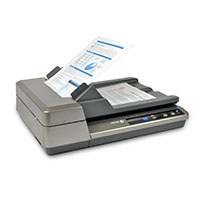 The Xerox® DocuMate 3220 is a next generation duplex scanner that combines an A4/US Letter sized flatbed and 50-sheet capacity ADF (Automatic Document Feeder) to create an entry level scanner with all the best features of higher-end products. It can easily support the scanning needs of individuals in small and home offices or workgroups in the corporate world. Installation is as simple as inserting one DVD-ROM disc and connecting the scanner to a host PC via a high-speed USB 2.0 cable. The Xerox® DocuMate 3220 includes a powerful and robust productivity software bundle that provides all the tools for a document centric professional who needs to better organize, manipulate and communicate paper in their business. Scan checks, documents, business cards, credit cards, photos or thick card stock with one touch simplicity. The Xerox® DocuMate 3220 front panel provides simple single button control for at-device scanning to any of 9 preset and up to 99 completely customizable OneTouch scan profiles. To keep any scanner operating properly, certain maintenance should be performed at different stages in the life of the product. Please contact us for more information on where to purchase parts and accessories for your scanner. We frequently update our drivers for new features and for compatibility with changing operating systems. For optimal performance, we recommend you keep your driver updated by finding the most recent drivers here. We also provide useful user guides and manuals to help you make the most out of your scanning experience. Xerox® and DOCUMATE® are trademarks of Xerox Corporation in the United States and/or other countries. All other trademarks are the property of their respective owners.